These days I am on a mission to find a good drugstore foundation that doesn't leave a hole in my pocket yet works well enough to keep me looking good. During this hunt, I have tried quite a few foundations and the one am talking about today is L.A Girl Pro Matte HD Long Wear Matte foundation. L.A. Girl does some amazing products and that too in super affordable prices that makes it more attractive ( for me at least) and that's the reason I keep on trying products from them time to time. A while ago I reviewed their Pro HD Long Wear Illuminating Foundation (Review HERE) and it still is my favourite for winters. 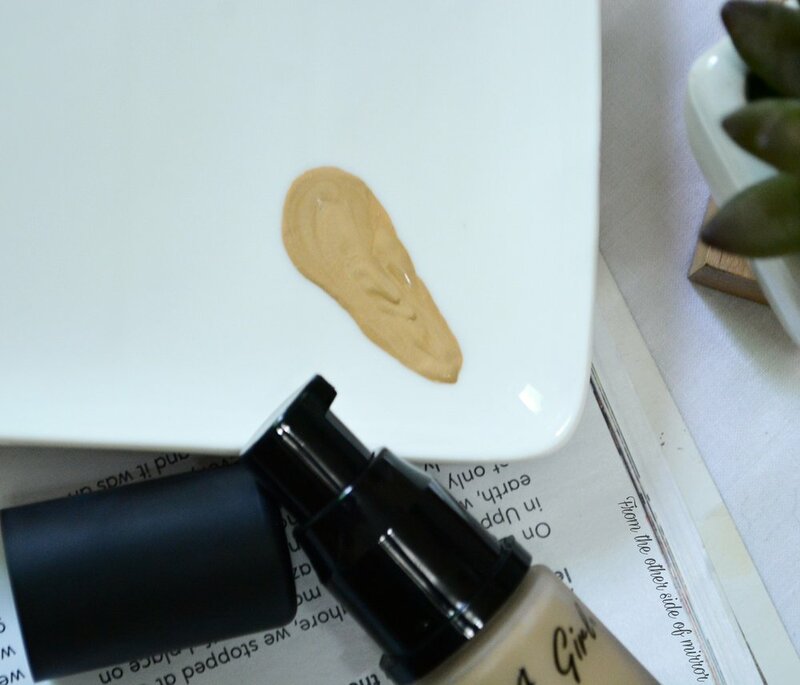 Also their Pro Concealers are a cult favourite and beauty gurus swear by them. Given these reasons, I got this foundation with high hopes and I am not disappointed rather pleasantly surprised, you'll get to know about that in a bit. The L.A. Girl Pro Matte HD Long Wear Matte Foundation comes in a sleek frosted glass pump bottle with a total of 1 FL Oz/ 30mL product which is pretty standard for foundations. One pump dispenses enough product to cover whole of your face. The cap secures nicely, still I would advice extra precaution if you are traveling with it. I am a sucker for frosted bottles and this one looks absolutely gorgeous! The product has a medium consistency and is neither runny nor too thick, just liquid enough to spread well and be easily blended. Before dispensing the product, just shake the bottle well enough to mix the product well. When I dispensed the product it came out with a Seperate white streaks which I assume are the mixing medium, after which I was instantly put off and wasn't willing to even use it on my face but once I put on it was sheer magic! The product lives up to its claims of soft suede finish that is sheer to medium but fairly buildable without getting caked up . There is no smell of the product which is a good thing because the Illuminating version has a paint like smell which puts off many people despite it being a great product. One thing that is so great about this product is that it blurs your pores! Yes you heard it, it makes them almost invisible and gives a smooth, flawless finish that looks like a filter in real life! If you pair it up with a pore filling primer, I can guarantee you won't even recognise your own skin! Even without any primer, its works amazing on its own. It stays for a good 8-10 hours and starts getting shinny after 4-5 hours in this humid weather. One thing to be mentioned is that this foundation oxidizez on me and get a shade darker than it actually is, but once blended nicely it doesn't show much and I am as happy with it as I could possibly be! The shade I have is Beige which has a yellow undertone and goes well with my loght medium skin tone. For reference I fluctuate between NC 25-30 according to the season and sun exposure and have been leaning towards a deeper side these days. All in all, I can safely say LA Girl have made a home run with this foundation which is a perfect match for oily skinned beauties. This soft suede, demi matte finish foundation is non transferable and stays put for so long that you wouldn't belive it is a drugstore product. Highly recommended and I would be keeping backups for sure! The L.A. Girl PRO Matte HD Long Wear Matte Foundation retails for 10$ at their Official Website HERE. In Pakistan you can find it at Vegas.pk (that's from where I got it). Now its available at Daraz.pk and Beautybar.pk as well.